RIO DE JANEIRO (Reuters) - Scientists identified the Zika virus in the saliva and urine of two infected patients, a top Brazilian biomedical research institution said on Friday, prompting its president to urge pregnant women not to kiss strangers just as local carnival celebrations begin. The discovery added to the rising concern over Zika, which is spreading rapidly in the Americans and has been linked to thousands of severe birth defects in Brazil. They said they used genetic testing to identify the virus in saliva and urine samples from two patients who had symptoms caused by Zika infection, and determined that the virus was active, meaning it had the potential to cause infection, scientists at the public Oswaldo Cruz Foundation said. They said more research was needed to determine whether Zika could be transmitted by either fluid. This marked the first time the mosquito-borne infection that has prompted a global health scare has been detected in saliva and urine, the scientists told reporters in Rio de Janeiro, host of the 2016 summer Olympic Games in August. The vast majority of Zika infections have been caused by mosquito bites, but word surfaced this week of infections caused by sexual transmission and blood transfusions. These developments come just as Rio kicks off its annual carnival celebrations, a raucous five-day bacchanalia known for street parties and lots of alcohol and kissing. Some revelers even keep track of the number of complete strangers they kiss. Because Zika has been linked to the birth defect microcephaly, a condition in which infants are born with abnormally small heads and can suffer developmental problems, the Oswaldo Cruz Foundation scientists recommended that pregnant women take special precautions and avoid crowds during carnival. "In light of the possibility of being in contact with someone who is infected, do not kiss, obviously," Dr. Paulo Gadelha, the foundation's president, told reporters. "We cannot say today that there is no possibility of transmission," Gadelha added. Fiocruz, as the foundation is informally known, said it made the discovery after carrying out a partial genome sequencing of the virus found in the samples from the two patients. "Imagine the social and economic impact of having a mega sporting event with millions of attendees with a brutal infection in the country ... especially at a time we are going through an economic crisis," said Dr. Leonardo Vedolin, a neuroradiologist in Porto Alegre. There is no treatment or vaccine for Zika. Most infections cause either no symptoms or symptoms including a mild fever, skin rash and conjunctivitis that normally last for two to seven days, according to the World Health Organization. Its association with microcephaly and Guillain-Barré syndrome, a condition in which the body's immune system attacks part of the nervous system, has increased alarm over Zika. 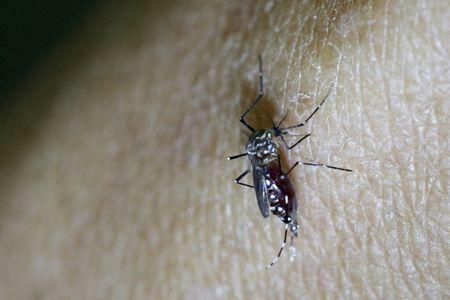 Researchers are working to confirm that the virus causes those conditions. Brazil's government may decide to revise a law next week that restricts the country's ability to send medical samples abroad, and does not clearly define protocol when a public health emergency, like Zika, is involved. Two government sources said the decision would be made at a meeting next Wednesday between the health, science and technology ministries as well as President Dilma Rousseff's chief of staff. Brazil's health ministry said it had been collaborating with the U.S. Centers for Disease Control and Prevention to try to nail down whether Zika causes Guillain-Barré. Of medical samples collected in Salvador, in northeast Brazil, one third will remain in Brazil and the rest will go to the United States for research, the ministry said.